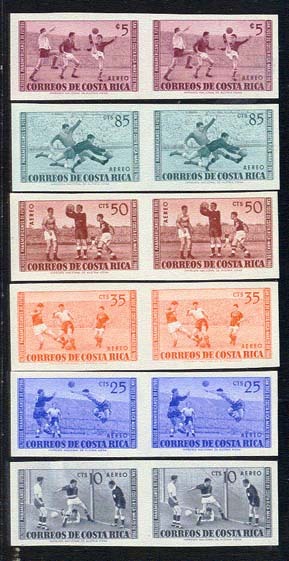 2525 ND COSTA RICA (1960) Soccer*. Set of 6 imperforates. 3rd Pan-American Soccer Games. Scott Nos C283-8, Yvert Nos PA283-8. Also available as pairs as shown in scan. 3234 ND COSTA RICA (1960) Girl by Renoir*. Imperforate pair. Scott No RA8. Postal tax to benefit the Children's Village. 3739 ND COSTA RICA (1960) Boys with cups*. Imperforate pair. Scott No RA9. Postal tax to benefit the Children's Village. 3740 ND COSTA RICA (1960) Children singing*. Imperforate pair. Scott No RA10. Postal tax to benefit the Children's Village. 5146 ND COSTA RICA (1960) Father Peralta*. Imperforate pair. Scott No RA7. Postal tax to benefit the Children's Village. Peralta left a bequest that led to the creation of the village. 16029 ND COSTA RICA (1961) Miguel Obregon*. Imperforate. Scott No C320, Yvert No PA317.